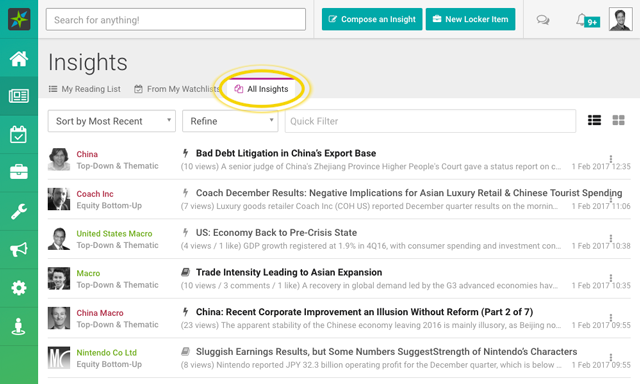 You can see other Insights which have been published but haven’t made it to your Reading List by clicking on the All Insights tab under Insights in the left sidebar. This provides you with a complete list of Insights that have been published on Smartkarma. If you find an Insight or Insight Provider that has heretofore escaped the clutches of your Reading List, you can always choose to Follow that Insight or Provider and future Insights by that Provider or in that Stream will automatically come into your Reading List. Likewise, you can add an Entity to your Watchlist if an Insight about it was not on your Reading List. You can read more about Watchlists here.